What is Borosilicate Glass? Borosilicate glass is a very unique and specialized variety of glass. Its composition is different from the "soft" glass that is normally used for beads, paperweights, art glass bowls, ornaments, etc. Borosilicate glass is far stronger than "soft" glass and has been used for everything from stovetop cookware to nuclear waste containment. One of its most frequent uses is to make scientific glassware such as beakers and test tubes. Chemical Composition... Chemically speaking, borosilicate glass substitutes boron oxide particles in place of the soda and lime particles found in soft glass. The boron oxide serves as a flux or glue to hold the silicate particles together with aluminum oxide and sodium oxide. Because the boron oxide particles are so small, the silicate is held together more closely resulting in a much stronger glass. Borosilicate glass is also highly resistant to the strongest of chemicals and acid compounds. Unusual Durability! 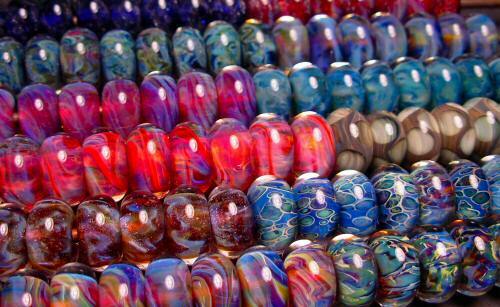 One big reason we prefer to work with borosilicate glass is because it results in a much stronger finished piece. 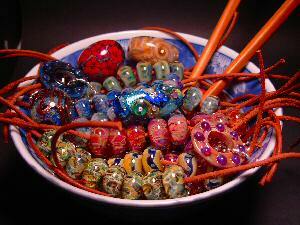 It will stand up to a lot of wear and tear without having to treat it as carefully as soft glass jewelry. It often amazes people how many "accidents" this glass can survive without breaking or cracking. Unlike soft glass, Borosilicate glass is also immune to the corrosive (etching) effects of natural fatty acids found on human skin and the Alphahydroxy acids found in many skin care lotions and treatments currently on the market. Unique Color Palette...Another major reason for using borosilicate glass is the amazing color palette available. There are actually fewer colors available to work with but each one is an organic, living color that can be manipulated and shaded with careful torch work and annealing. The finished piece appears much more dynamic and vibrant. Also, because of the chemical composition of borosilicate glass, different precious metals such as silver and gold may be used to color the glass in some very unique and amazing ways.